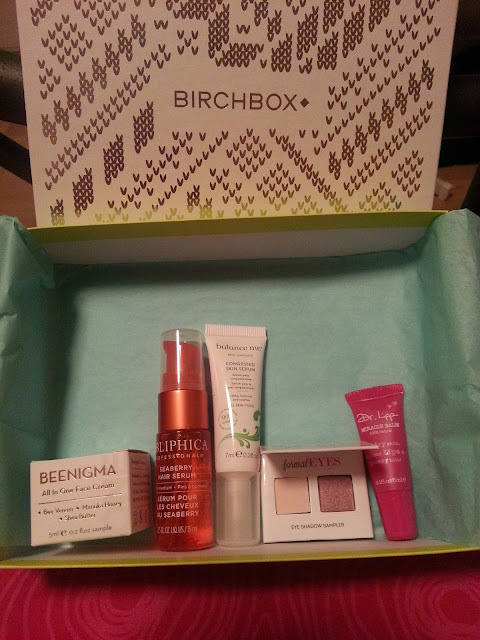 I just now realized that I still hadn't written a review for my Birchbox from December. Oops! My January box just came yesterday or the day before, so I need to get on that! Bee venom has been getting a lot of buzz (sorry, we couldn’t resist! ), and now we know why: it’s basically the Botox of the natural world, minus the needles. Made of New Zealand bee venom and 20+ Manuka honey, this paraben-free cream increases collagen and elastin production, lifting, plumping, and reducing fine lines and wrinkles. Even better: it renews damaged skin cells, giving you a youthful, radiant glow. Looking forward to trying this one out! I've heard great things about bee venom! Hopefully it won't irritate my sensitive skin. Hair need a little rescuing? This super fruit-fueled serum is here to swoop in and save the day. Antioxidant-rich sea buckthorn berry, the anchor of this lightweight serum, helps to treat and repair dry, damaged hair. Strands are left smooth and shiny without a heavy, greasy feel. I'm getting a little sick of hair samples. I have so many, and my hair isn't fine or medium. Even the most diligent daily skin routine can’t thwart all blemishes. Fortunately, this lightweight, “on the spot” treatment has us covered in a skirmish with a wayward pimple—or a prolonged battle against stubborn trouble areas. With a divine scent and smooth application, this calming serum refines pores and balances skin without drying, and is free of parabens or sulfates. Blemishes, we’ll beat you yet. I totally forgot this was in my box, because I could have used it quite a bit this past month or so. My skin has been like heeey, breakout city! Once one clears, another pops up. Not fun at all! Few things excite us more than getting a shiny new shadow palette. The only downsides? Not knowing the best way to coordinate shades, and not being able to fit our favorite hues in our clutch. The pros at Coastal Scents fixed these conundrums with these handy mini-palettes. Designed with specific scenarios in mind, these exquisite color collections feature perfectly complementary shades in purse-friendly sizes. The socialEYES palette comes with beautiful, deep neutrals for everyday looks, the formalEYES palette offers lovely nudes and rosy pinks for a big night out, and the glamourEYES collection boasts gorgeous, bold colors for special occasions (or any time you crave a little va-va-voom). Mine came in a light beige and a purple colour. I still haven't swatched these yet.. hopefully they are as nice as they look in the package! We sometimes spend weeks picking out our new go-to lipstick color, which is why we like to make sure our lips are smooth and silky instead of cracked and dry. This balm is a favorite among celebrity makeup artists and dermatologists because the 100% natural formula completely rehydrates depleted skin and lips. Bonus: You can also use it to sooth sunburn, tame brows, and nourish thirsty skin anywhere on your body. It’s tasteless, odorless, and effortlessly powerful. I've heard great things about this and I can't wait to try it. I'm trying to finish up some other balms first. This will probably get a little review in an empties post.